I may have spoken about cities such as London being lonely places, but in their vast, sprawling disarray, they can also be the most inclusive. The city of London may be large, but it is comprised of several smaller communities within it, leading to a rich diversity of peoples, culture and languages. Oliver O’Brien, a researcher from the UCL Geography Department, has created a map based around the London Underground stations, looking at the most commonly spoken second languages. This gives a visual representation of the variety of groups that inhabit the city. On O’Brien’s blog there have been calls to represent his work on a larger scale, including train stations across the whole of the UK, as well as other European capitals such as Paris. A key comment has also been that of ‘market research’, in terms of business owners using the map to know the best market to set up a new eatery or similar. But why is this important? Why do we see groups of those speaking the same language clustering together, and why is this something we want to know? In relation to the body and the poem I quoted earlier, we can extrapolate from this data to reach the most superficial aspect of our bodies. Skin colour. How we look. A mark of our heritage and a shared experience, and ultimately in a new environment, finding bodies that share these characteristics has been found to be a comfort (Ben-Ner et al, 2006). The poem speaks of the city being oblivious to the colour of the authors skin. This, to me, speaks of the diversity of a city. We are used to seeing a whole spectrum of ethnicities in one tube carriage and see this as entirely normal, but coming from a country, or town, that is less familiar with forms of migration, it may be a shock. And when you come from a minority in one of these less diverse areas, to come somewhere and no longer feel that… well, you gain an impression from the poem about how that must feel. The city is diverse, but it is composite. A mosaic of bodies. Sometimes this can go wrong, and cause tensions, but often it can work well, offering a sense of unity in both the small and large community. Maybe self defining as Somalian, Portuguese, Scottish or American, but at the end of the day, all being Londoners. *Beyond us all being Londoners, I would also like to go on a brief tangent as to why this divison of skin colour may not be as stark as it appears. Neil Harbisson is an artist who was born colour blind, but has an ‘electronic eye’ that allows him ‘hear colour’, becoming what he deemed, a cyborg. Ironically for a person who could previously quite literally see in black and white (achromatopsia only allows vision in greyscale) he is quoted as saying ‘I found out that there are no black or white skins. 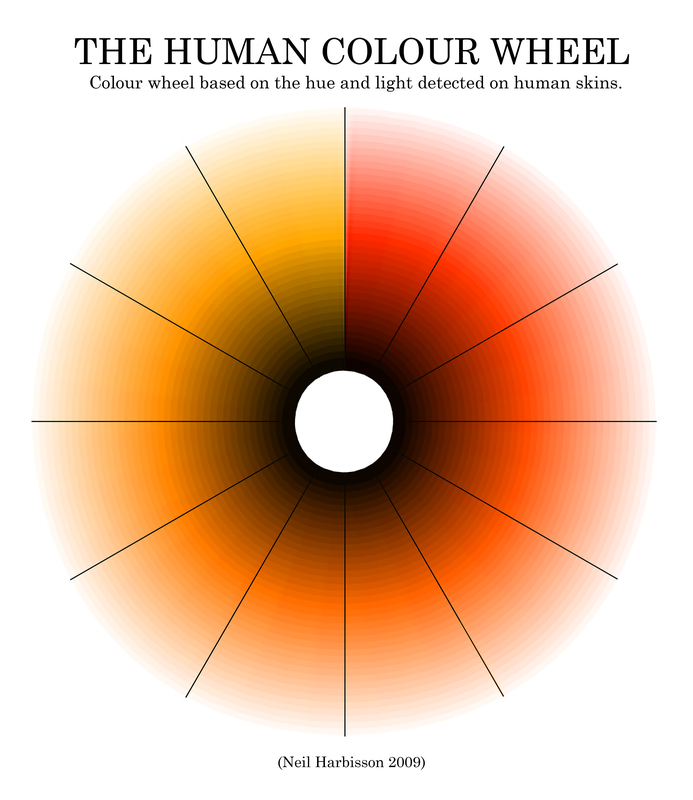 We all are different shades of orange.’ The way we view colour is a very ‘human’ experience which helps us to categorise our world, which we have seen throughout history, from apartheid to my example of community division within London. I wonder what it would be like if we were all to experience the world through our bodies in the same way as Harbisson, through sound rather than colour? It is likely we would still distinguish through tone, as it is human nature to want to ‘classify’ what is around us. 2. Goodwin, M. H. (2006) The hidden life of girls: games of stance, status and exclusion, USA: Blackwell Pub. 5. O’Brien, O. (2014). Tube Tongues. Available: http://oobrien.com/2014/10/tube-tongues/. Last accessed 29th April 2015.